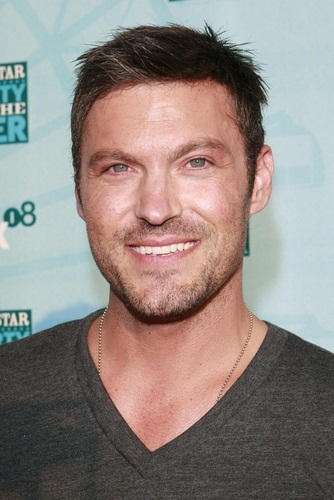 Brian Austin Green is an American actor and rapper. He is known for his role on the television series Beverly Hills 90210. He has experimented with hip-hop music and has released an album. Brian is the son of Joyce (Klein) and George Green (George Lewis Green), a country and western musician. He has three children with his wife, actress and model Megan Fox, and a son with his former partner, actress Vanessa Marcil. Brian added the middle name Austin because there was another actor named Brian Green. Brian’s paternal grandfather had English and Scottish ancestry, and Brian’s paternal grandmother was of Italian descent. Various web sites state that he also has Irish, Hungarian, and Cherokee Native American ancestry. It is not clear if this is accurate. Brian’s paternal grandfather was John L. Green (the son of William Jesse Green and Ettie Iona Johnson). Ettie was the daughter of John Johnson and Eva. Brian’s paternal grandmother was Elvina Mary “Pat” Coscarelli (the daughter of Giuseppe “Joseph” Coscarelli and Rosina “Rose” DeRose). Elvina was born in Indiana. Giuseppe was born in Cosenza, Calabria, Italy, the son of Raffaele/Raphaele Coscarelli and Teresina Bonofiglio. Rosina was born in Paola, Province of Cosenza, Calabria, Italy, the daughter of Pietro DeRose and Teresina Quintieri. Ettie was the daughter of John Johnson and Eva.